Sanghvi Brands is the exclusive licensee of the French brand L’Occitane and Elle spas & salons, globally renowned Warren Tricomi salons and two fitness brands; the Holyfeel Gym and celebrity trainer Mona Briganza. Darpan Sanghvi is the mastermind behind India’s largest International spas & salon’s chain master franchisee- Sanghvi Brands. Exclusive licensee of the French brands- L’Occitane and Elle spas & salons, globally renowned Warren Tricomi salons and two fitness brands- the Holyfeel Gym and celebrity trainer Mona Briganza. “These are the 5 international brands we’ve got to India. We’ve signed up over 50 locations in India and about half of them are already operational this is between all our brands,” noted Sanghvi in an exclusive conversation with WI Bureau. Nevertheless, Sanghvi is also the founder of MyGlamm, an online portal that provides hair and beauty services at a consumers’ doorstep. Lets unfold some more about the entrepreneurial journey of this very intellectual young entrepreneur who revolutionized online and offline business of Indian wellness industry by introducing two supercool ventures. MyGlamm we’ve launched in July 2015, and delighted to report that we did so well since its launch, as the brand has become a market leader in this category. We are by far way ahead then any wellness service player, with strong presence in Mumbai and Pune. We have a corporate team of over 70 people, we’ve got more than 50 artists who are delivering service every day. We have two of India’s largest training academies in Mumbai and Pune at MyGlamm m.
We’ve got services at MyGlamm m, which you know people have not seen before. For example, we’ve launched Novalash Eyelash extensions on MyGlamm m in Mumbai and Pune. Even most Salons have that in these two cities but come first on our portal. It was a boot-strapped venture. In 2014, our brick & mortar venture raised funds. We have Tano Capital that came in as private equity investor last year in the brick & mortar business. And, last year we’ve launched our online venture that has also raised funds from FICCI and again Tano Capital who invested in my brick & mortar venture, has also invested in my online venture. We’ve recently launched High Definition (HD) brows from The UK’s 2000 salons. Again, we are the UK’s exclusive partners as you know, the most asked for basic service is threading, the most common need of every women. But the point is- how do we make it glamorous? So, we’ve brought ‘HD Brows’ that all the celebrities use. Now you get, eyebrows like a celebrity, sitting at house with MyGlamm. That’s the kind of exclusive portfolios we’ve got to the country, which are hyper exclusive. Our strategy on MyGlamm is to make sure that our portfolio is strong enough to make our venture way superior than anyone else in the market. I’ll talk about the brick & mortar first, in Sanghvi Brands, the biggest challenge is getting good real estate and that too at the right price considering all our large outlets. While the second challenge with both online and offline business is - access to talent. Getting good artists, good technicians and training them is not as easy as it seems. So, we are overcoming that challenge by creating great academies. Let me tell you, we have beautiful pipeline of people whom we are continuously training and upgrading their skills. So that the talent pool is here and we have immense staff. For instance, I don’t know my locations, but if I have a trained staff and I may locate in Kashmir, then they may go there. So we keep a bench staff to take care of any attrition that might occur. Coming back to the first challenge of getting good real estate, I think that’s where our brand helps us. As we’ve got brands like L’Occitane and Warren Tricomi, hotels and land owners are willing to offer us the right location that too at reasonable price, because, these are the brands adding value to the overall development. We’re already present in 15 cities across India. We’re looking to stick to lifestyle and wellness as that’s our core strength. We already have Yoga, Meditation, spa treatments, Ayurveda, beauty treatments, facials, haircuts, make-up and fitness. We plan to remain in whole lifestyle and wellness space, which is grooming, pampering and fitness. We’re not getting to foray into medical space in near future. We’re the market leader when it comes to the international brands chain. We’ve 25 locations and overall 50 have been signed, so, the remaining 25 is expected to be live in span of next 12 months. 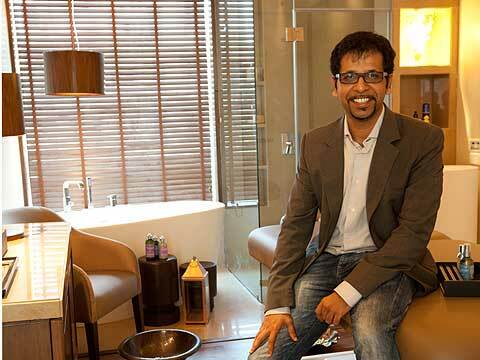 There is no global brand whose spas & salons are spread in 25 locations in India. So, we’re again the market leader there. Then, on the online business, within 4-5 months, we started doing more than 10,000 services in a month which, I find, is more than anyone else is doing. We do not franchise and even don’t want to. We are the master franchise but, don’t have plans to sub-franchise at all. So after creating a niche in India, we’re foraying into global market. So Now, I’ve got Loccitane master license for Middle East, United States and Indian Oceans. So we’re growing over these and we just find our four new locations in the Middle East out of which two is Loccitane and other two are Warren Tricomi. It yet to be announced in the market. We’re in the process of setting our first location in the US as well. For Sanghvi Brands, the goal now is to become a Global leader because we’ve become the market leader in India. However, MyGlamm is only present in Mumbai and Pune right now, so our next focus is to enter Delhi, Bengaluru and Chennai. Eventually, with MyGlamm, our plan is to spread in 36 cities in India. I cannot disclose the figure, but may let you know, the company is profitable which not many spas & salons company are, in India. We actually made good profit last year. For the last three years, Sanghvi Brands is seeing 100 per cent year-on-year growth. It’s fairly new to comment on MyGlamm, but still we’re seeing growth of 80-100 per cent monthly. In United States for instance, I’ve hired a very senior spa Director to maneuver the spa for Ritz Carton and Bliss at Cent Ridges. She’s building out the operations there. In the Middle East right now, one of my star spa director from India has gone to conduct initial set up. It’s a Mix between providing opportunities to my existing team here plus locals (in global market) to be a part of the team. At Sanghvi Brands, each sub brands have its own pricing strategy. With L’Occitane and Warren Tricomi, the pricing strategy is to get to the top of the market. when we go into cities, we see 5 star hotels as in what are the prices of services, we survey the day spas and make sure that the pricing of our both the brands is in line with the top salons and spas of that city. Our prices differ in cities. While our pricing with Elle (spas & salons) is moderate as in we won’t be in the top price as per the city. With Sanghvi Brands, we’re limited to Top 12 cities and resort towns of India. Our current 25 locations will become 50 as we already find new 25 locations that will soon become operational. With MyGlamm, we will be in tier I, II and III because its service at-home and everybody needs it. Our next step with it would be to enter in three more cities to make it five city presence initially. Eventually, the plan with MyGlamm is to reach 36 cities in India. What’s cooking in BBlunt for 2016..